The Chicago Consultation, which advocates for the full inclusion of LGBT persons in The Episcopal Church and the Anglican Communion, has issued a 67-page collection of essays and questions about the Anglican Covenant titled “The Genius of Anglicanism: Perspectives on the Proposed Anglican Covenant.” The publication is targeted to Episcopalians, but the thought-provoking essays will be of interest to Anglicans in other Communion churches as well. 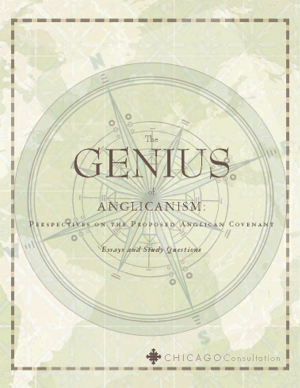 “The Genius of Anglicanism” takes no position on the Covenant, but, if you find its essays compelling, you will conclude that the case for the Covenant is anything but. “Genius” treats many topics related to the Covenant that have not been explored adequately elsewhere. Essays deal with such topics as the Episcopal Church’s Baptismal Covenant, the role of bishops, reception, and the role of laypersons. At the end of each essay are related questions. Thus, “Genius” could easily be used as a study guide or, at the very least, as an important resource in a study of the Covenant.